A Bunny in a Bubble Pocket - a Free Pattern and Tutorial. Today quite a few of the sewing/DIY bloggers are honoring Anne Weaver of Craft Gossip. Jessica of the Sewing Rabbit is the mastermind behind the idea, and I think it was great of her to organize it. If you haven't been to Craft Gossip, it's a great source of inspirational projects and tutorials. 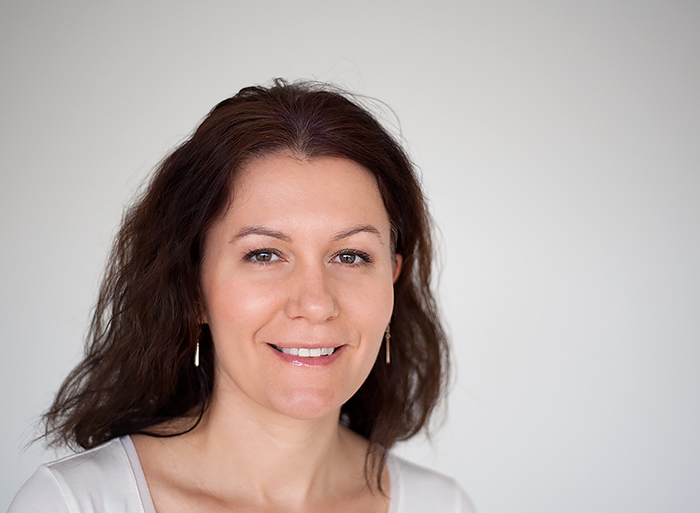 Anne featured quite a few bloggers, including me, and we are grateful for her support. My project was featured when I had been blogging for a very short period of time, and it brought a smile to my face. Thank you. The main dress pattern is the Norah dress by Mouse House Creations (affiliate link). I like the slightly exaggerated A-line of the dress, it makes it stand out. 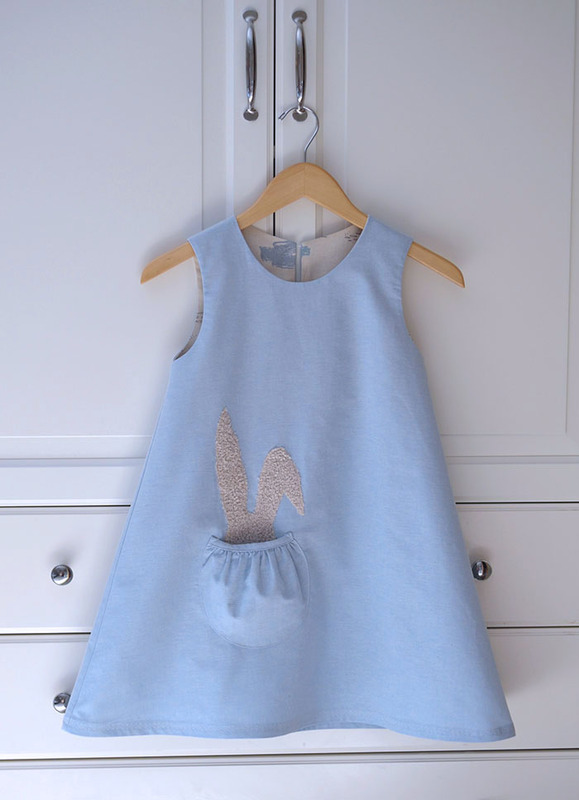 Want to make your own bunny in a bubble pocket dress? Of course, there is no need to put anything in the pocket, it's cute on it's own. Free bunny template and pocket pattern is HERE. 1. Stitch two parallel lines of basting stitches on top of the pocket. Gently pull bobbin threads on both sides and gather the fabric towards the center of the pocket. Pin the long edge of binding to the top of the pocket with its right side facing the wrong side of the pocket. Stitch in place at 7mm (1/4in) from the top. 2. Turn binding up, press the seam. Fold seam allowances at 1cm (3.8in) and press. 3. Fold binding over to the right side and stitch close to edge. 4. Run basting stitches around the pocket at 7mm (1/4 in) from the edge. Pull slightly at the bobbin thread until the edges curve to the wrong side of the pocket. This will help the seam allowances to stay flat. 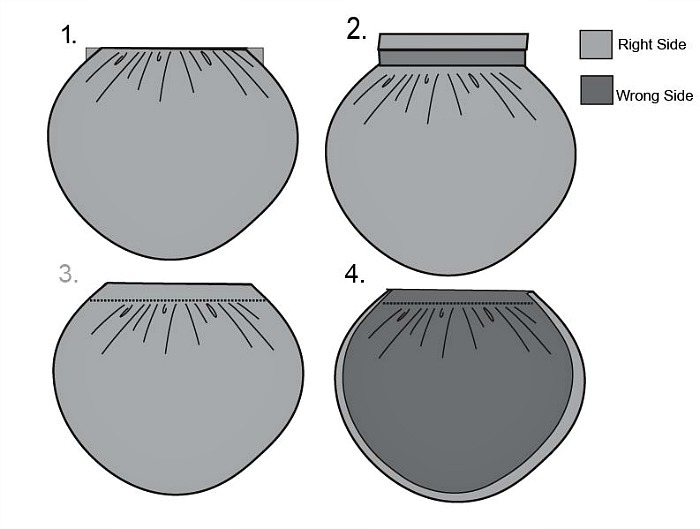 Turn seam allowances at 1cm (3/8 in) and press them flat. 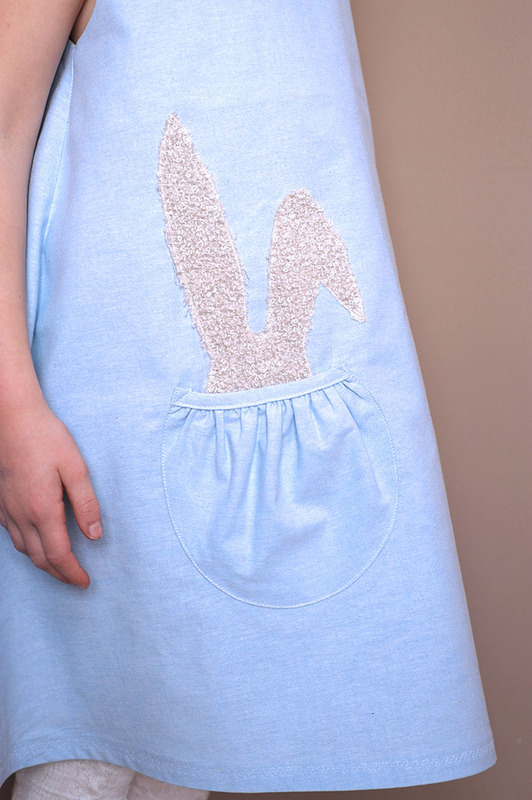 Pin the pocket to the dress and edge stitch all the way around (if you choose to place a bunny in your pocket, attach it to the dress first). You might choose to stitch bar-tacks (short zig-zag stitches) at the beginning and end of the stitching line to secure it. Ta-da! Enjoy the new bubble pocket. A variety of mediums can be used to cut out the bunny. I used a scrap of textured wool fabric, it think it worked quite nice. Knit or woven fabric will work as well. If using thin fabric, applique it first. Use straight stitch for the knit fabric and zig-zag or blanket stitch for the woven fabric. I was right, Ania loves her bunny dress. I also realized this will make a perfect Easter dress. I would love it if you follow me! Very sweet! Love the pretty dress color too!! That is SUCH a great idea and she looks adorable!! Easter dress, check! I am so jealous of her hair everytime you post photos of Ania! The dress is adorable, love the little bunny! It's adorable!! Love your fabric choice - such a beautiful color... And that pocket with the bunny is so much fun! That little detail on the hem is the cherry on top. Your stitching is perfect... You are amazing my friend. Olga, this is so adorable. I love everything! The color of the fabric is so beautiful. You are right, the style of the dress is perfect for apply this idea. Oh, I'm loving your pictures!!! I'm in need some advice. Thank you so much, Maria! And your photos are always beautiful! Oh everyone needs a bunny in a bubble pocket! So adorable! I might even make an Easter outfit for my daughter now seeing this! Such a beautiful dress and that bunny is so precious! Congratulations, I'm loving your blog! I love the inner and out fabric. Can you share the details of the fabric type etc.? Thanks! Thank you so very much for this sweet post! Y'all made me feel like a total rock star. Oh, how cute!! I love this sweet dress!!! I hope Ania got tons of compliments on that Easter dress. She is getting so big! It's fun watching our kids grow up on these posts. Super cute! Love how we can play around with applique! I'm sure your daughter love the dress so much. Lucky girl! I love this so much and I see all kind of usages!